FreelanceForCoins.com is place where you can find freelancers ready to be paid with cryptocurrencies (Bitcoin, Ethereum and others). We believe that freelancers of the future will definitely use cryptocurrencies more. Those have number of advantages over regular coins, namely: pseudonimity (Bitcoin BTC, Bitcoin Cash BCH, Ethereum ETH) or anonymity (Monero XMR), no restrictions (doesn't matter what your age is or what your country is - you can use cryptocurrencies), instantly settlement (no waiting days until money arrives in your bank account), immediate international transfers, no possibility of your funds being frozen. So, we launched FreelanceForCoins.com - a marketplace for freelance services that enables everyone to find customers that will pay in cryptocurrencies and freelancers that accept them. Isn't Bitcoin and others volatile? It is still an issue. But think of this. If you have earned $100 in 2013 in BTC - you'd have $13 000 now (in February 2019). If you'd have invested $100 into stock market in 2013 - you'd only have $167.. How's that for volatility? 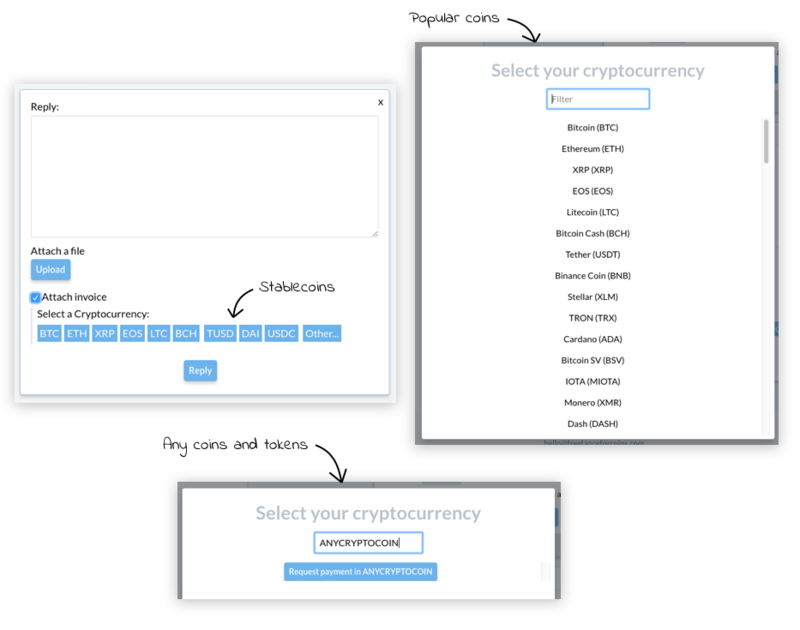 Besides, you can always request payment in one of the stable coins (TUSD, USDC, DAI or PAX). Those are pegged to 1 USD. You can easily convert those to other coins using something like Exodus wallet. Or convert your BTC, ETH, BCH to one of stable coins as soon as you receive the payment usin something like ChangeNow (don't exchange big amounts in one change) or you can convert it to EUR/USD using Bitstamp, Kraken or CoinBase. You can publish "Offers" for your services, so that customers can order something or if you are a customer and require something special, not yet listed on "Offers" page - you can start a "Project" and find freelancers that will help you. When you find something that interests you - you can contact the freelancer right from FreelanceForCoins.com - we have an integrated chat system and invoice system.